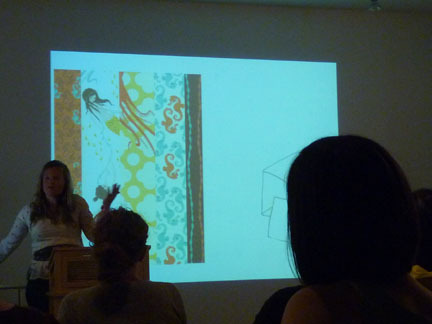 Heather Ross spoke and showed slides of her artwork and fabric designs last night at PNCA (I was sitting at the back with a point & shoot and I apologize for not not casting Heather in the best light). I really enjoyed hearing about her design process. She talked about how fun it is to create youthful fabric designs and how, through that focus, she draws youthful people to her. The theme of much of her work has emerged from her free roaming childhood in rural Vermont. Heather spoke of her inspiration from the DIY movement and how much she enjoys how people use her fabrics for different quilting and craft projects. I had a Summer of Making poster signed by Heather after her talk and she complimented my shirt. I was happy that I was able to share one of the projects I have created with her fabric. I got inspired after the hexagon night at the latest Portland Modern Quilt Guild (PMQG) meeting and the arrival of the blank tees to make a shirt with Heather’s fabric. 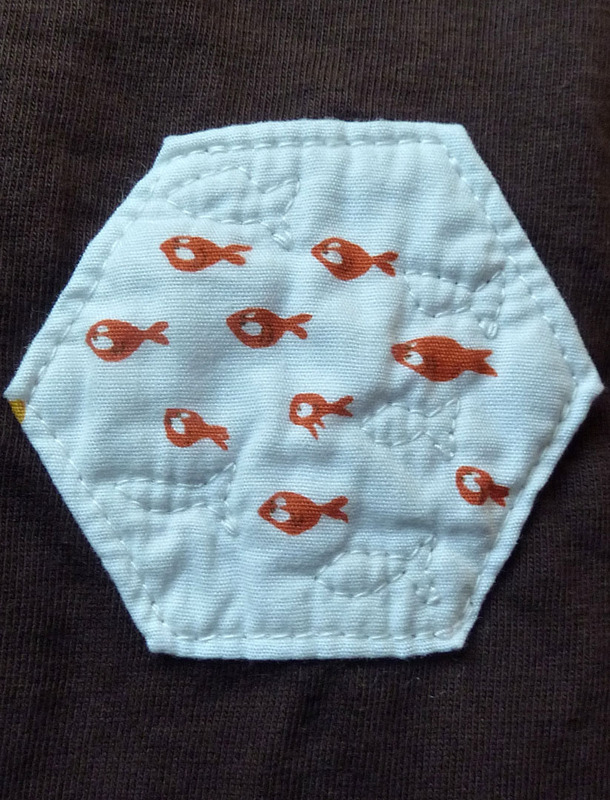 I used the 1.25″ hexagon I just bought from TabSlot. 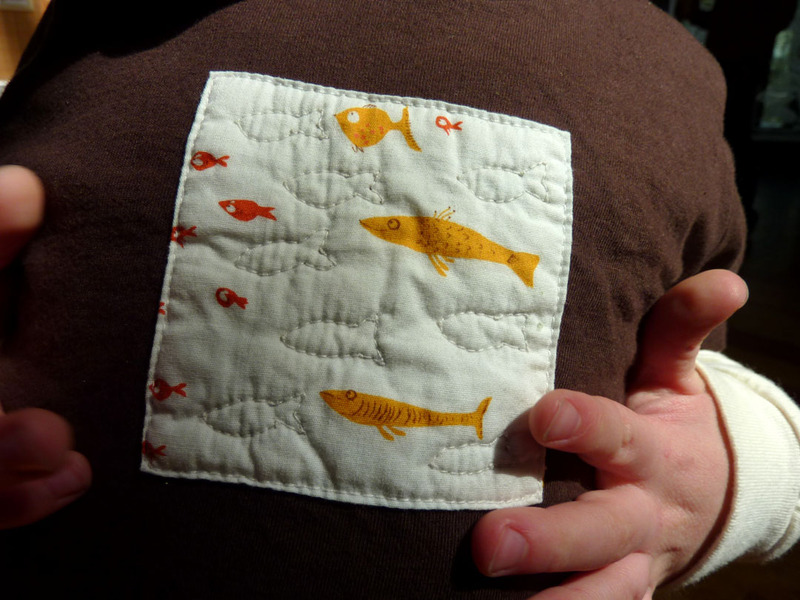 I used Heather’s Swim Class fabric from the Mendocino collection for the first shirt I made for Henrik. It is still my favorite, but I plan to make a larger swatch for the t shirts for my Etsy shop. I love the prints from the Mendocino collection. I had no idea when I took my first quilting class at Bolt that the fat quarter pack I picked out included a few prints from the Mendocino collection. That quilt is waiting to be finished. I started to stitch in the ditch, but I did not like the look. I will be taking Elizabeth Hartman’s Freestyle Machine Quilting Workshop next weekend. I hope to get some inspiration and some new skills so that I will actually complete the first quilt project I started. 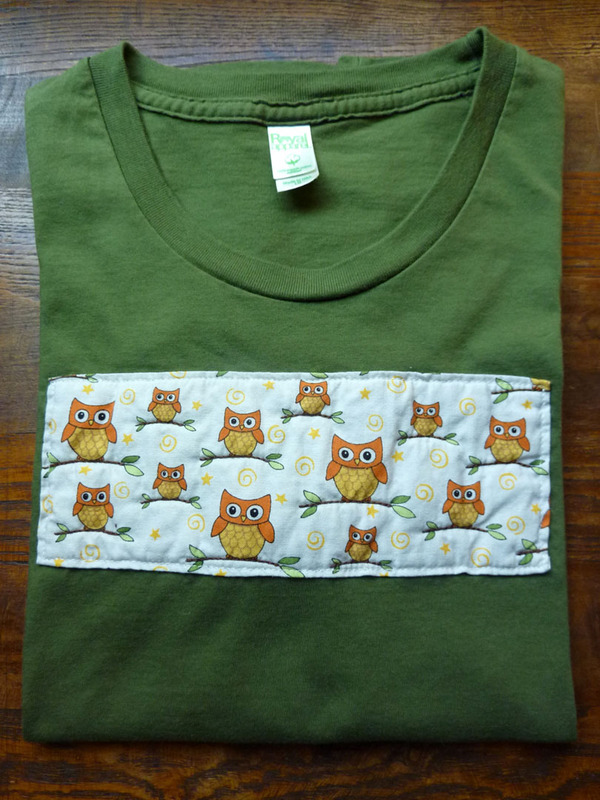 Here is the first Quilt Block Tee I made for myself with one of Deb Strain’s Love U prints. I finished it just before we went to the Sisters Outdoor Quilt Show. I am excited to finally get started on making shirts for my Etsy shop. I will share my completed designs along the way. I hope you are finding creative inspiration from someone, something or somewhere around you. This entry was posted in Create, Learn, Quilt, Quilt Block Tees. Bookmark the permalink. 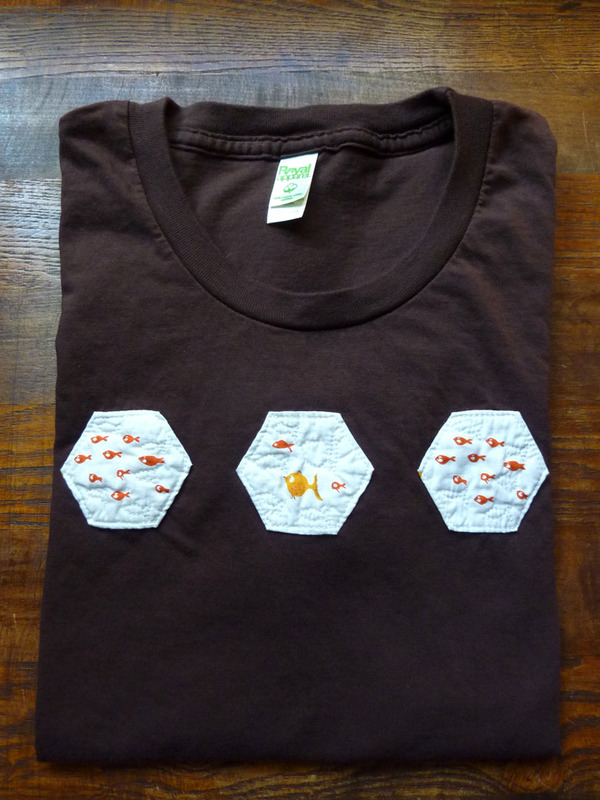 This entry was posted in Create, Learn, Quilt, Quilt Block Tees, Uncategorized. Bookmark the permalink.